Just sayin'. As the title of the comic says, "You are free to learn how to do anything anytime." :) It's funny, the mental blocks we put up. "I wish I could knit. 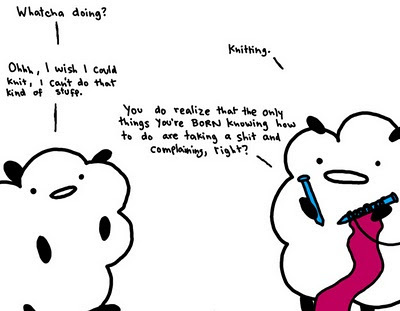 Knitting is hard." Me: "Like anything else, it takes learning and practice. It was three months before I got the hang of it." "I wish I could knit. I don't have time." Me: "Ever sit around waiting at a doctor's appointment? Ever sit around at a coffee shop waiting for someone to show up? Ever watch tv or movies? You have time to knit." "I wish I could knit. The two sticks thing confuses me." Me: "If you learned how to actually do it, you'd know what to do with both of them. They both have a purpose." - Was that hard to make? - Not really, in the sense that you're just wrapping string around a stick. It took me a long time because I actually have a job and a baby and stuff. - If I pay you, will you make me one? - Honey, you couldn't afford it. If you paid me for the cost of yarn, plus even minimum wage for my labor, you'd be looking at, like, 60 bucks at least for hat or scarf. Maybe a couple hundred bucks at least for a sweater. So, no, I don't work on commission. I knit for other people when I feel like it. - Can you show me how to make one? - I can teach you to knit, but you'll never get anything done unless you're willing to put in the time and effort to work on it. Knitting's only fast when you're already good at it, and even then, not always. - Why don't you just buy one instead of making it? - Um, because the point is that I enjoy the process of making something with my own two hands. Plus, a lot of the patterns I've seen are totally unique. I've never seen things like that in stores. - Isn't the point of knitting that it's cheaper to make something instead of buying it? - Again, no, the point of knitting is that I enjoy making something with my own two hands. - Is knitting the one with a hook? - No, that's crocheting. And both knitters and crocheters get annoyed when people mix them up. Even if you can't tell which is which when you're looking at a sweater at the store, you should at least keep the hooks vs. needles thing straight. Or, when in doubt, ask. Don't act like you know what you're talking about and then get it wrong. Knitting is not merely a hobby, a time-waster. It, like running, keeps me sane. It gives me a chance to let my creativity flow, and it gives me immense personal pride in making things. If you want to do it too - by all means, hop on board! I'd be happy to teach you. But if you're going to hem and haw about it, then don't waste my time - I've got knitting to do. Laughing in complete recognition. I knit a pair of socks during conference breaks and you would have thought I was curing cancer - people thought I was that brilliant.